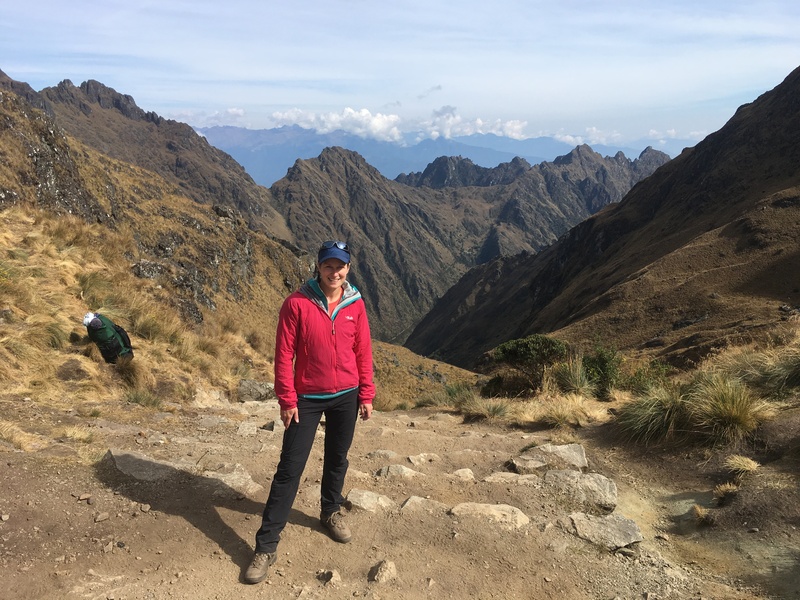 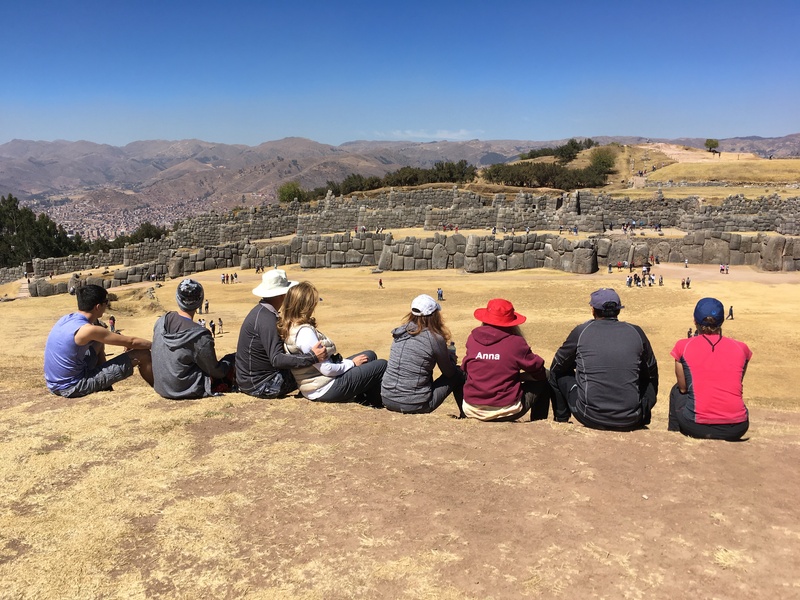 Flying into 3300m takes a bit of getting used to, but with a couple of days exploring in and around Cusco we acclimatised to the thinner air and were all set to follow in the footsteps of the Incas, from the Inca capital to their most important site in Peru, Machu Picchu. 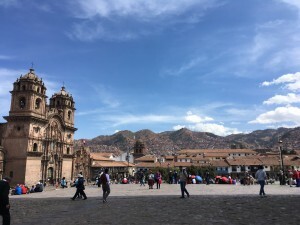 Cusco boasts the impressive temple ruins of Qorikancha (‘golden courtyard’ in Quechua), which gave us a good introduction to the Incas. 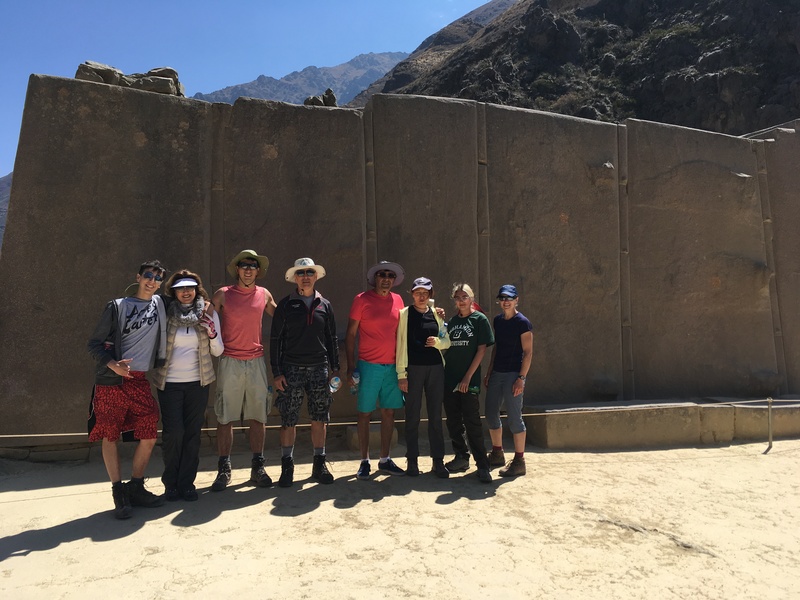 The upward tapering walls are perfectly crafted with carefully carved trapezoids fitted together to form earthquake proof structures. 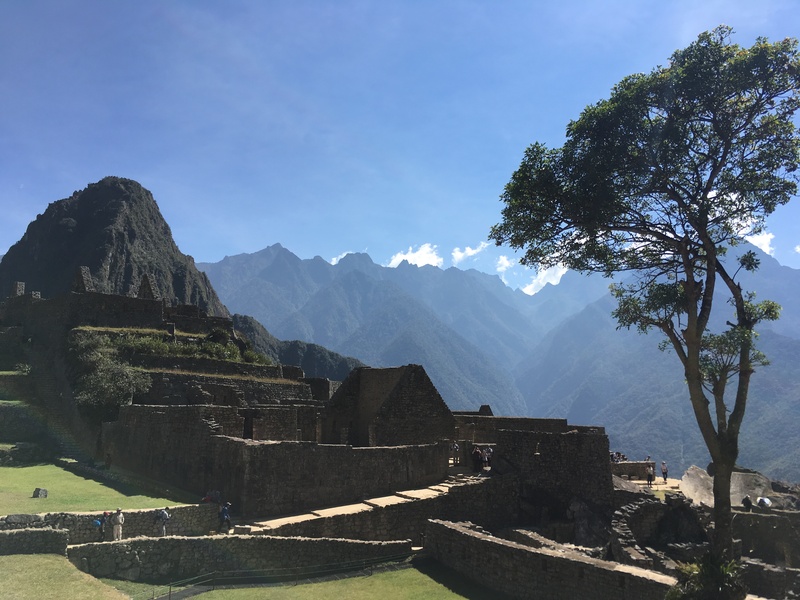 Temples were built without roofs to allow direct access to the elements which were sacred for the Inca people. There is also a vast cathedral on the main Plaza de Armas, built by the Spanish and a stark contrast to the beautifully simple stonework of the Incan temple. 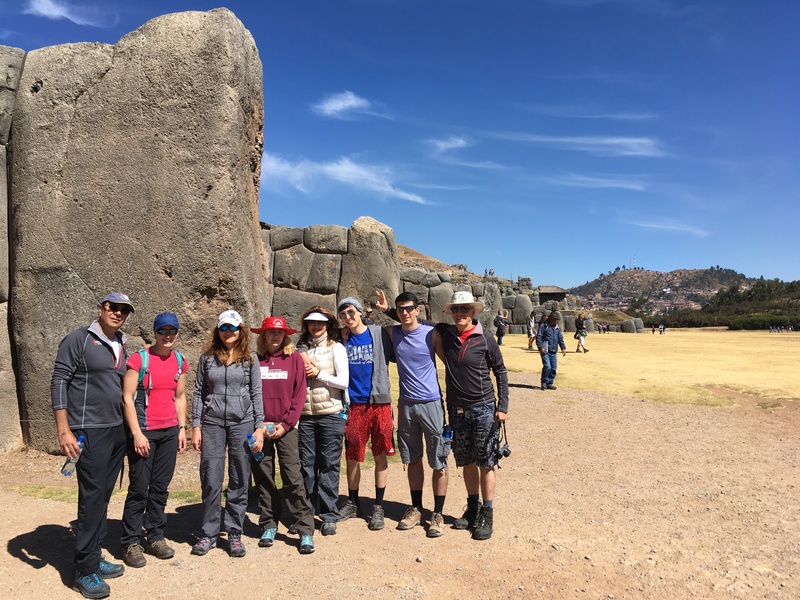 Our excellent guide Jose, born and raised in Cusco, taught us about the history and culture of the Incas, and took us next to Saqsaywaman ruins on the hill just above Cusco. Built by the Incas over hundreds of years, these zig zag shaped ruins stretch 500m and are designed to withstand earthquakes with their uneven form. 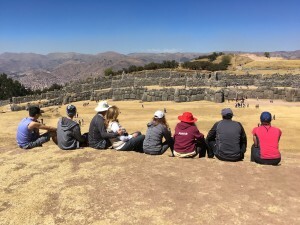 We walked the short 5km back from the ruins down to Cusco, passing families enjoying a Sunday afternoon picnic en route. 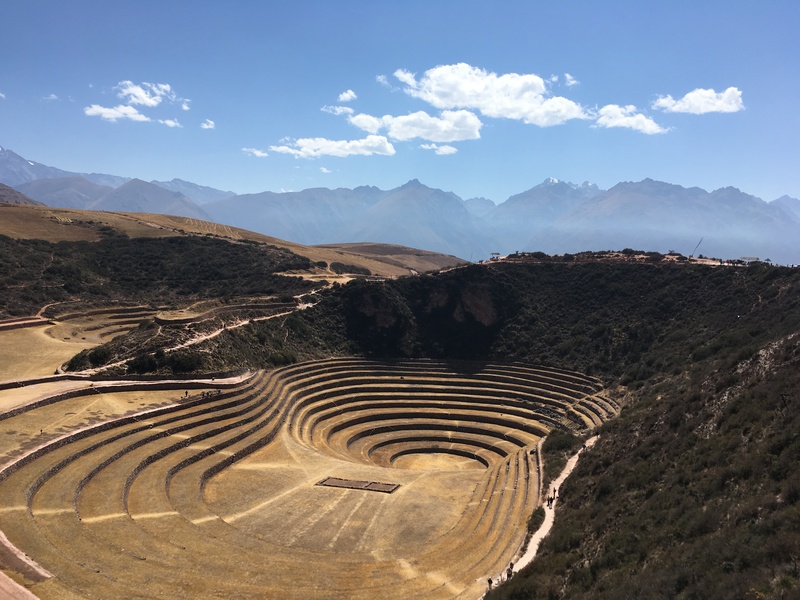 Today we left Cusco and headed towards the Sacred Valley, so called by the Incas because the land is more fertile than in the Inca capital of Cusco. The air in the valley is around 40% humidity compared to about 24% in Cusco, and it is also warmer, which means different crops can grow there. 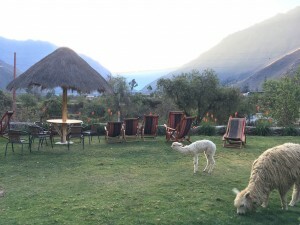 In the Sacred Valley alone, 6 varieties of potatoes are grown, along with quinoa, corn, apples, avocadoes and peaches. 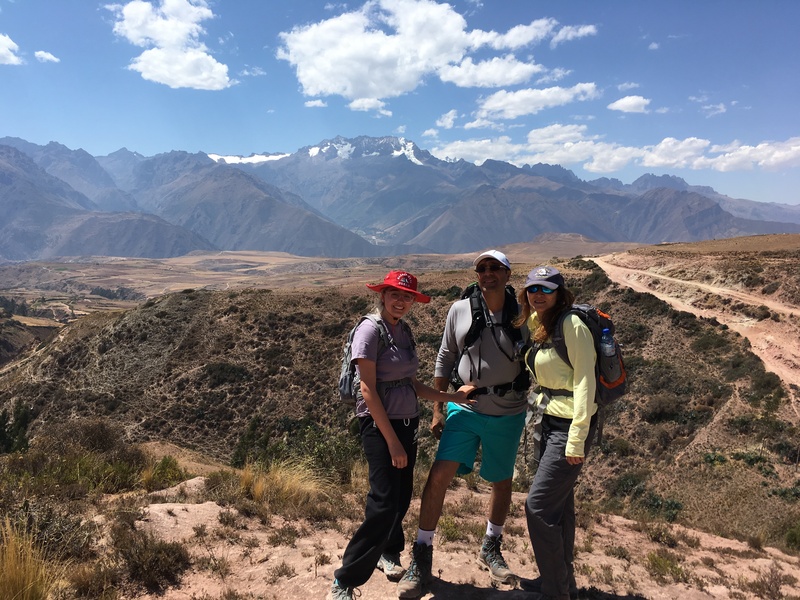 The Rio Urubamba flows through the valley and our trek will follow it for the next few days as we start the Inca Trail. 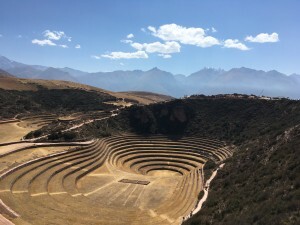 We stopped first at the archaeological site of Moray, stunning concentric terraces constructed by the Incas for agriculture. 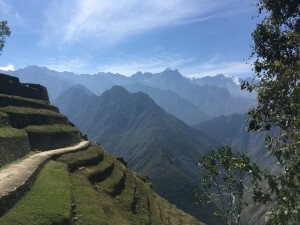 There is a huge temperature difference between the top and the bottom tiers, generating different climates in which to produce various crops. One of the circles has been completely restored, whilst the others are left as they were. 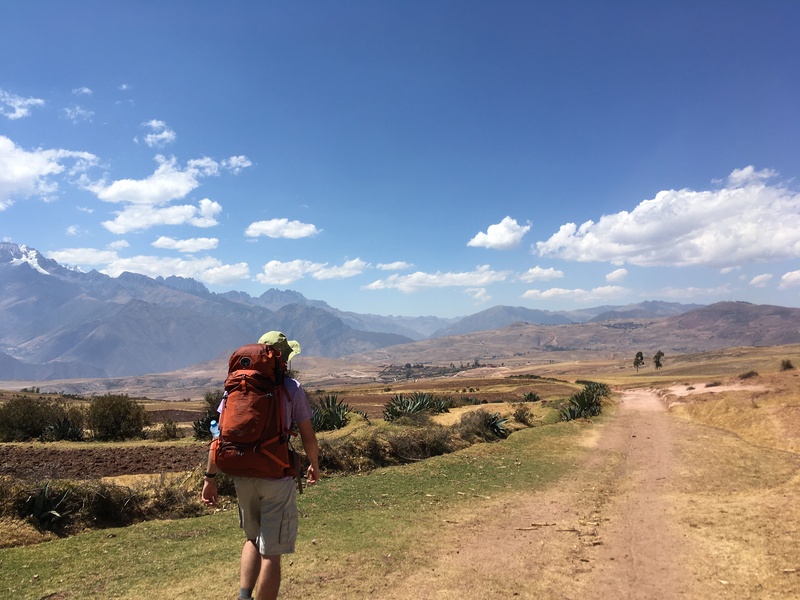 After visiting this sight we hiked a couple of hours across the Andean plateau, past jostling bullocks, dosing donkeys and horseback gringos to our lunch stop, where our team had prepared a fresh feast of chicken, steak, vegetables and bread for us. 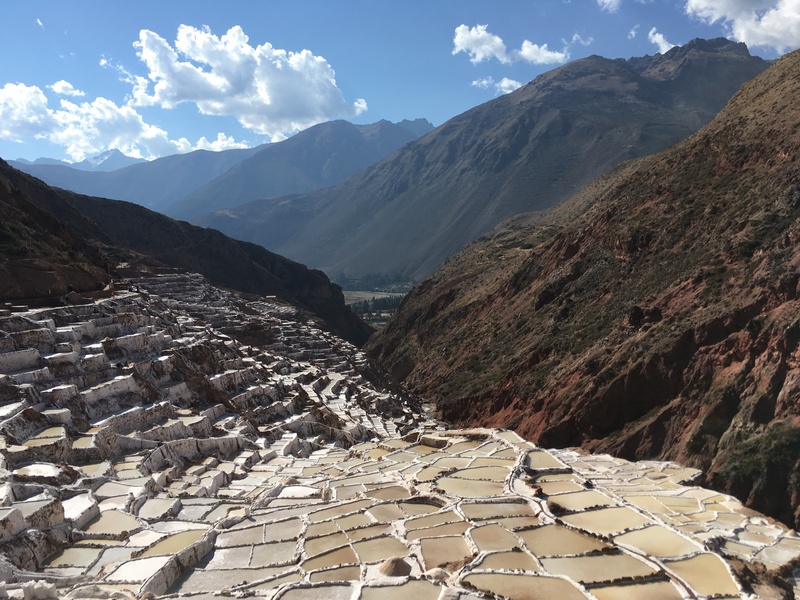 Later we admired the Maras salinas, which are Peru’s biggest salt pans. With different pools at different stages of the natural 7 week evaporation process, the pans reflected and glistened in the afternoon sun. 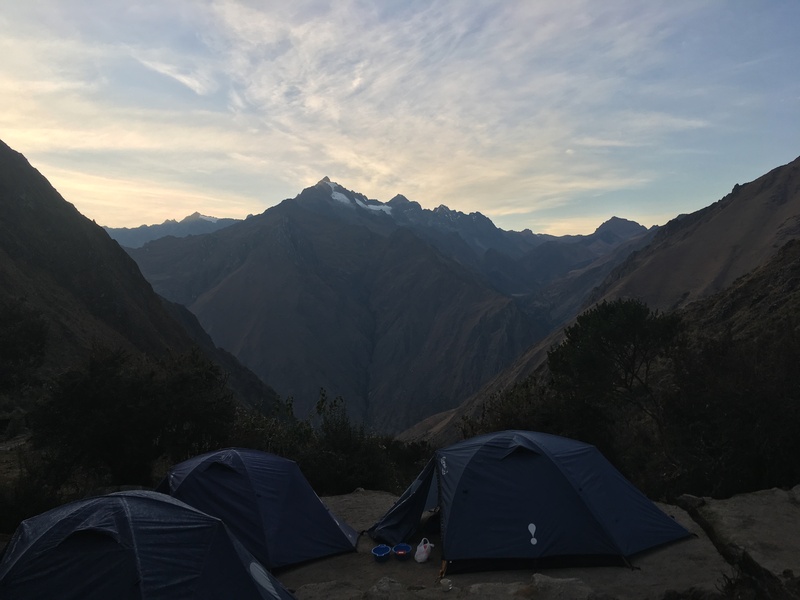 From here we drove to our last night in a hotel at Ollyantaytambo, before embarking on our Inca Trail trek the following day. 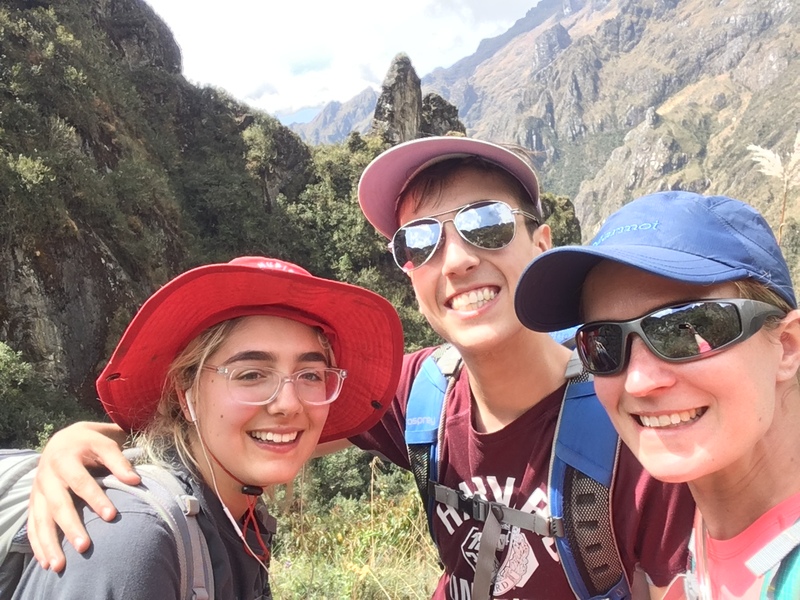 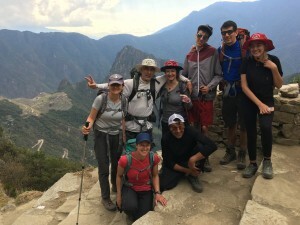 Our Ollyantaytambo hotel got everyone’s vote for the most stunning view so far, with the Sacred Valley’s highest mountain one way and an increasingly warm glowing bronze hillside the other, it wasn’t a bad start to our trek into the mountains. 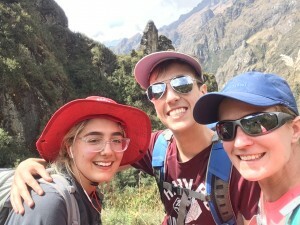 We had the chance to climb the steps up the ruins of Ollyantaytambo, prompting us all to remark how fit the Incas must have been. 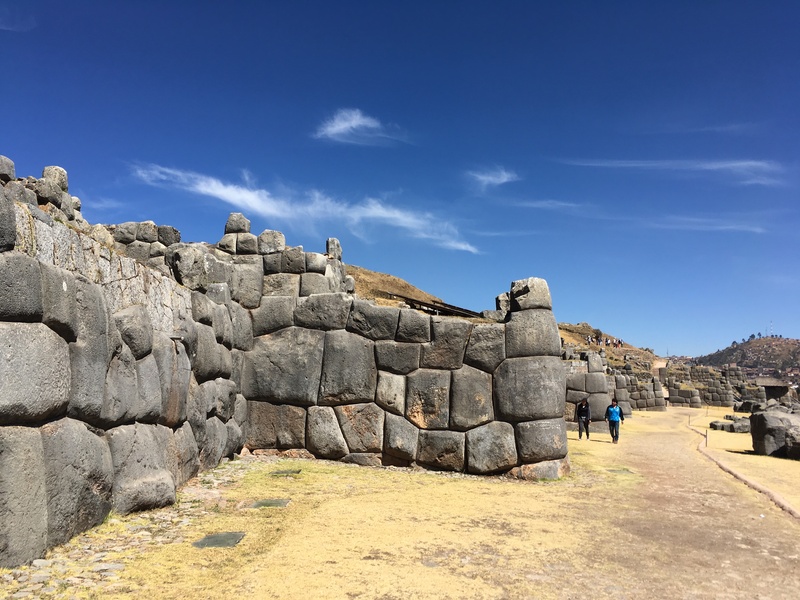 They dragged pink granite from a quarry 14km away, to construct the temple of the sun in the perfect position to catch the sun’s rays during the winter solstice (June 22nd). 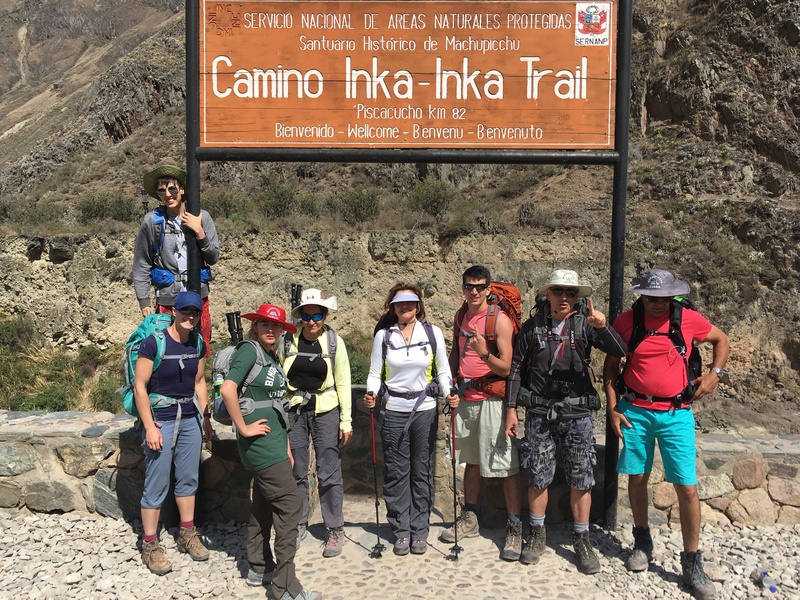 Today we would embark on the Camino del Inca, which we had been building up to for several days. 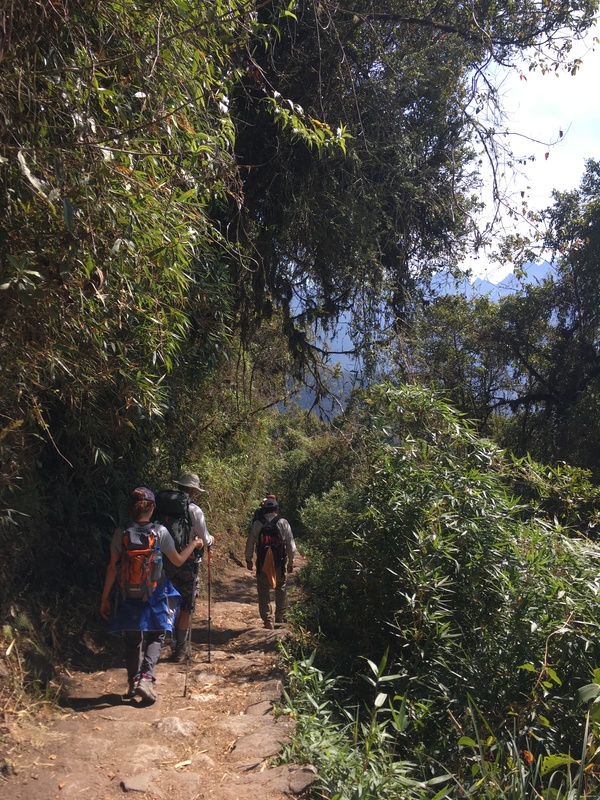 It didn’t disappoint; crossing the Urubamba river we followed the gently undulating trail up the valley past avocado trees, to our first campsite. 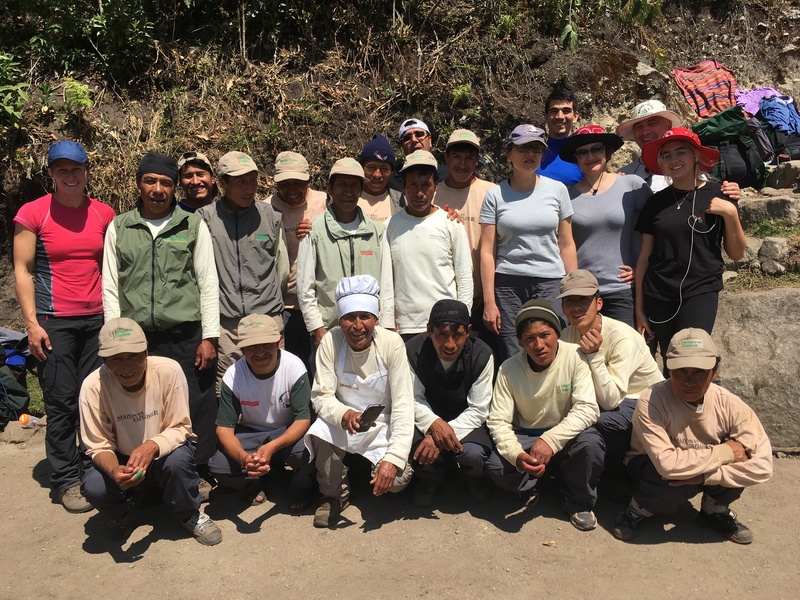 Here we met our fantastic team of porters and cooking staff. After our pumpkin and crouton soup followed by trout and yuka, we decided our cook Theodoro should be awarded at least one Michelin star. 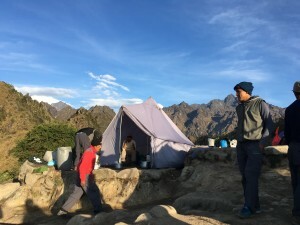 How he created such refined food in a tent we were yet to discover. We spent the first night camping at Llactapata, a stunning spot beside the river. A tasty Peruvian cooked breakfast was a welcome wake up after our first night’s camping, and set us up well for the day’s trekking. 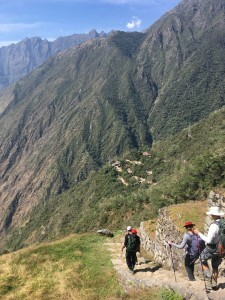 The 9km route for today took us up from the river through hamlets with plenty of donkeys and chickens. 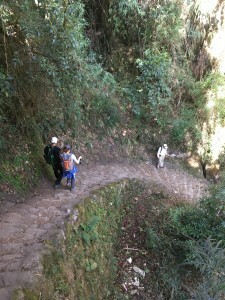 Continuing upwards after lunch, the trail entered vibrant forests where clear streams ran over rocks and onwards down the hill. The path ascended steadily and eventually we reached a clearing where we were treated to one of the best campsite views I’ve ever seen. 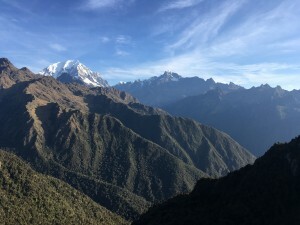 Veronica (5800m) was perfectly framed by the mountainsides down the valley, and as the afternoon sunlight turned to evening, the snow cap took on an iridescent glow. Another exceptional camp dinner of chicken noodle soup, beef wellington and mango flambé, and we were refuelled ready for an early night. 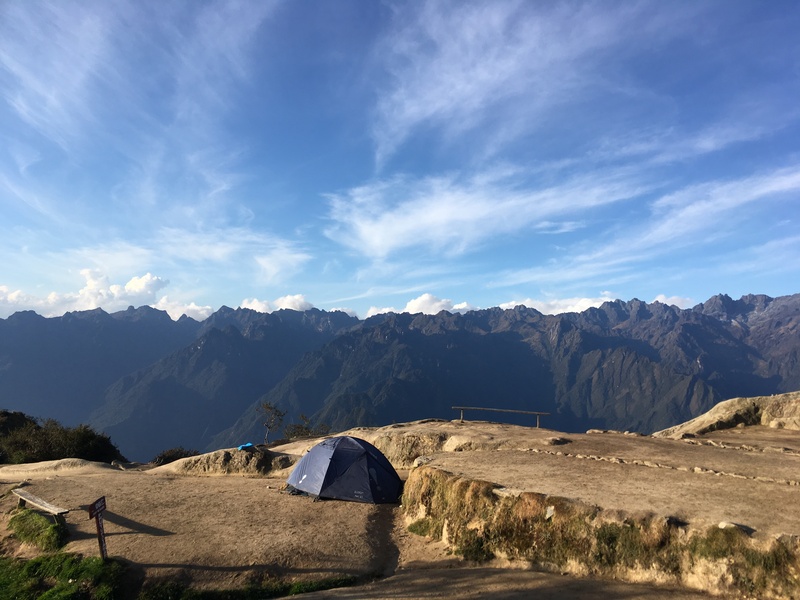 Aptly named Phuyupatamarca, ‘the place above the clouds’, our campsite tonight is even more stunning than yesterday’s. 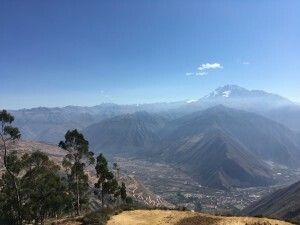 I’ve just watched a cloud inversion rise up in the valley below us, and admired the southern hemisphere’s constellation. 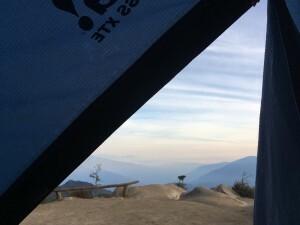 The only light in the sky was a distant storm, with forks of lightening shooting down from the clouds and lighting up the whole sky in that direction. Today was our hardest day’s trekking so far, covering 13km and climbing 2 high passes, and the whole group rose to the challenge. 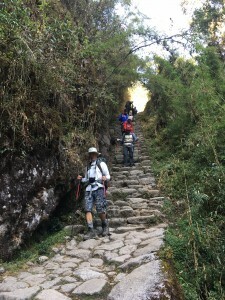 Warmiwanusca, or ‘dead woman’s pass’ at 4212m, was our first hurdle, which we climbed straight out of our campsite, before descending the far side to a well-deserved soup stop. 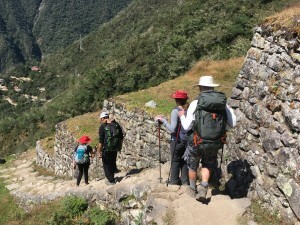 Ascending again we climbed the second high pass (3998m) and dropped down to contour around the forested valley past Incan fort ruins. 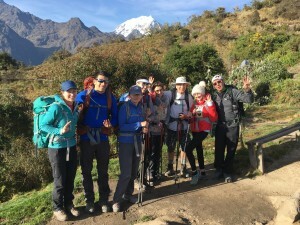 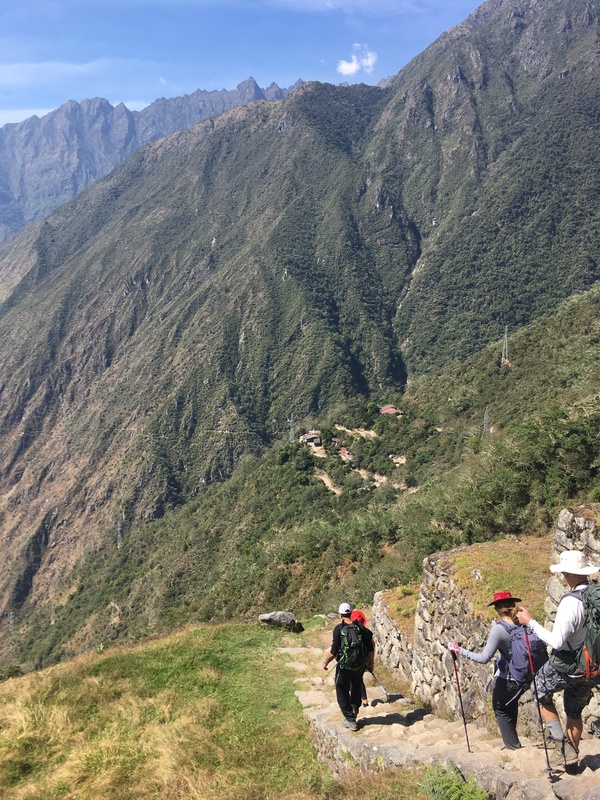 A late lunch followed, after which came the final stretch and the highlight of the walk, through tropical cloud forest, traversing the mountainside on a carefully constructed Incan path. 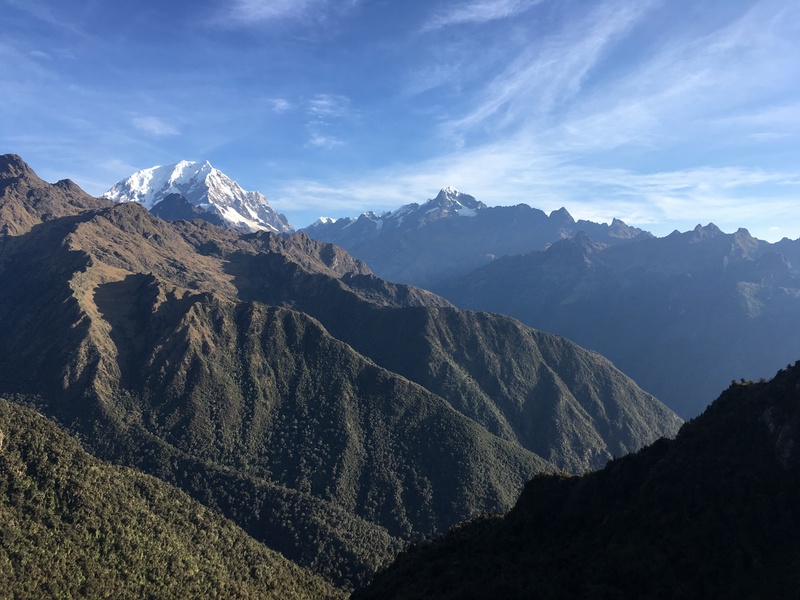 Rain came and went, interspersed with sunshine to produce a rainbow across the mountain, and moody clouds as far as we could see, with occasional shafts of sunshine breaking through the clouds. 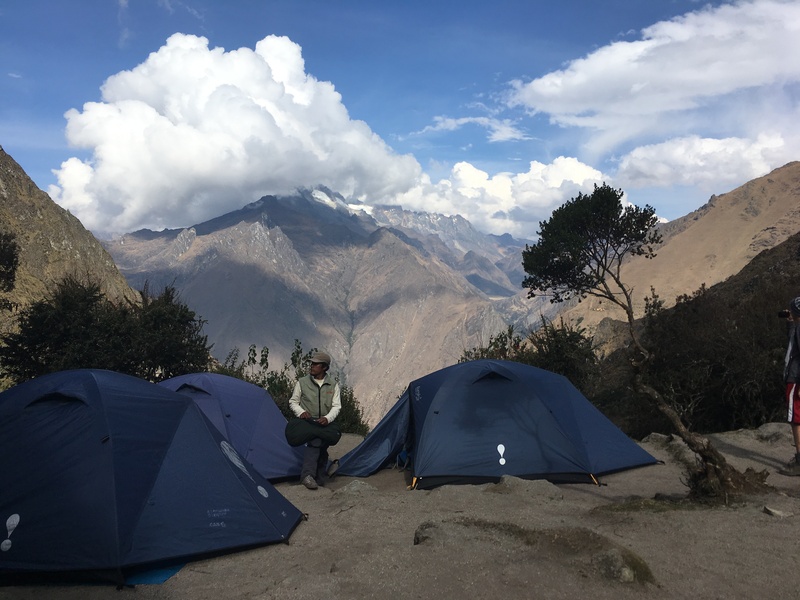 Eventually the rain cleared to reveal snow-capped peaks Salcantay (6200m) and Veronica (5800m), and we soon arrived at our campsite above the clouds. With a sense of anticipation we awoke today knowing the hardest part of the trek was behind us and we would finally reach Machu Picchu. 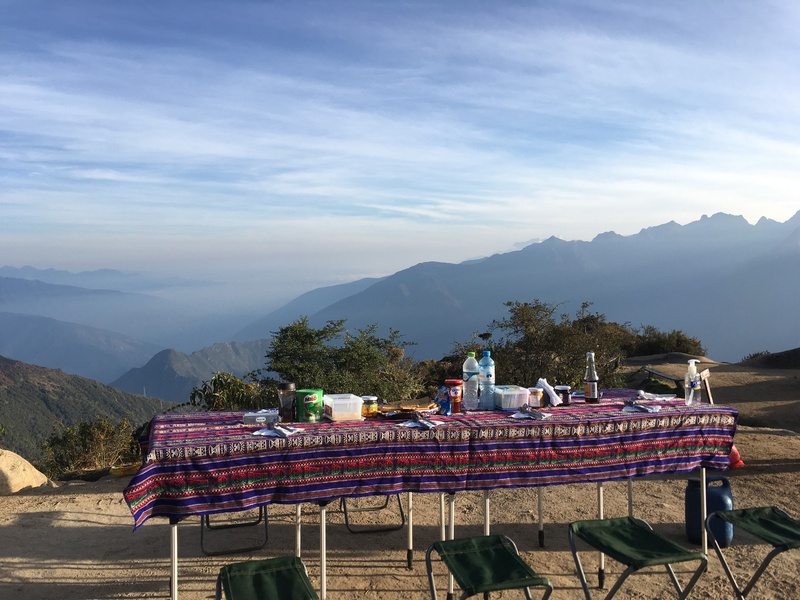 Theo treated us to pancakes for breakfast, which we enjoyed al fresco watching the sun rise over the Andes. 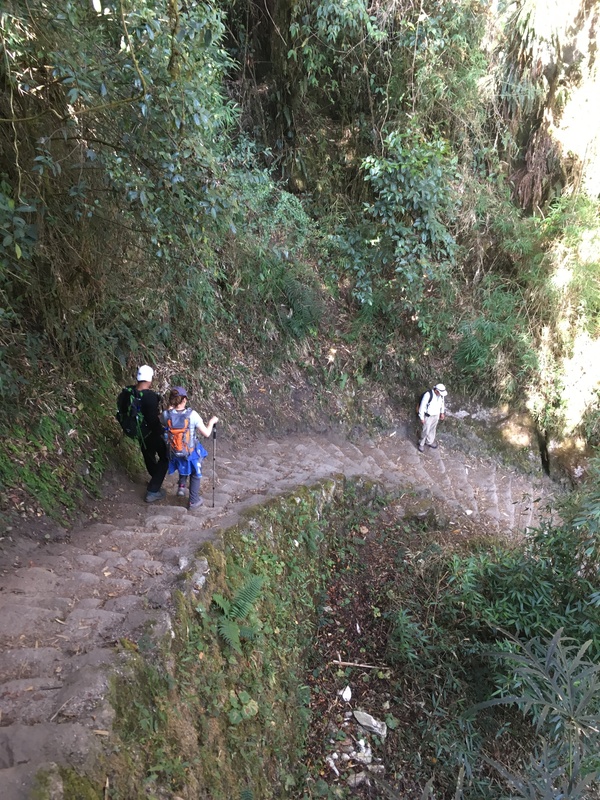 Most of the hiking today consisted of steps down hill through beautiful cloud forest, tough on the knees but better than the uphill! 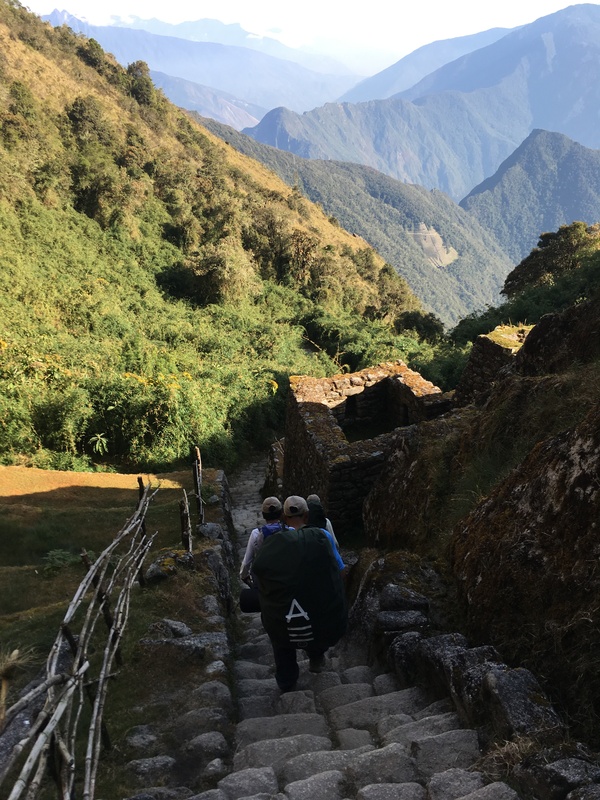 With a shout of ‘porters!’ we all stepped to the side to let the locals run down the steps, and when I say run, they truly flew down with hefty loads and dancing feet. 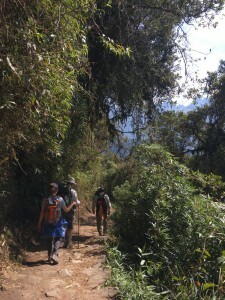 The forest was alive with birds, snakes (just the one) and dense, verdant moss-covered trees. 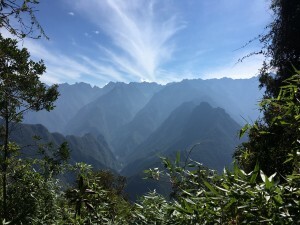 After a final camp lunch at Winay Wayna, we said farewell to our superb team of cooks and porters. 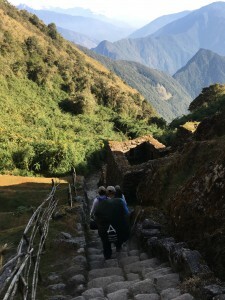 As the trail followed the contours of the mountainside we approached our final destination, and with a last steep section of Incan style (1ft tall!) steps we walked through the Sun Gate (Inti Punku). 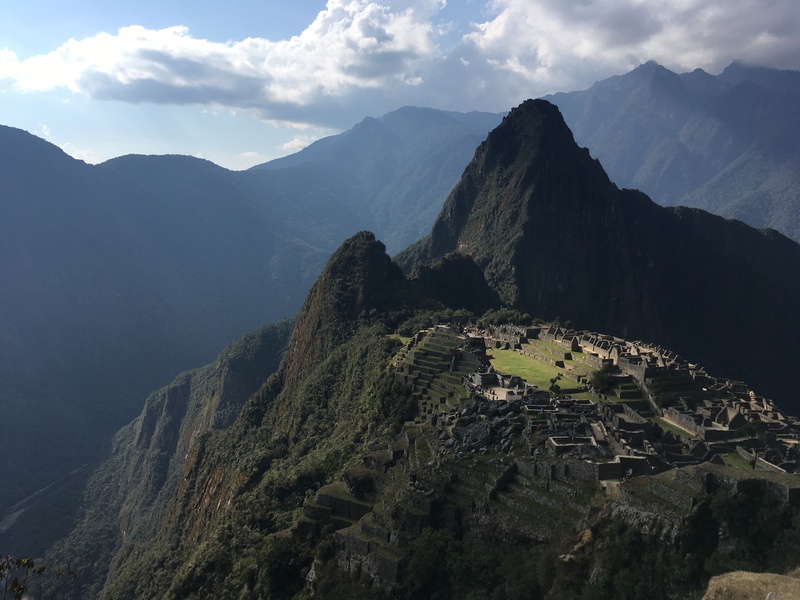 Situated on a saddle precisely in line with the windows of the Temple of the Sun (in Machu Picchu itself), the Sun Gate gave us our first magnificent view of the site and we were all pretty taken aback at how impressive it was. Having stopped at several Incan ruins along the trail, Machu Picchu was very striking as it is not a ruin, but a collection of meticulously constructed temples and buildings perched on a mountain. We would get the chance to explore properly tomorrow but for the moment our focus was on a well-deserved hot shower in Machu Picchu Pueblo. 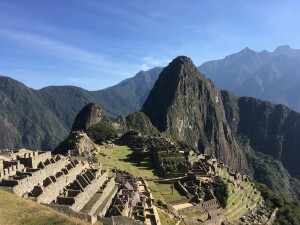 Machu Picchu, or ‘Old mountain’, was built by the Incas around 650 years ago, using granite and quartz. 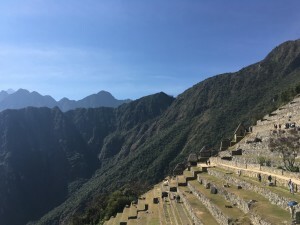 It was re-discovered by US explorer Hiram Bingham in 1911, who had originally come to South America to research historic trade routes, but he was so blown away by it that he spent the subsequent years researching the history and purpose behind the site. He concluded that Machu Picchu had been a place where the educated came to teach and to learn. 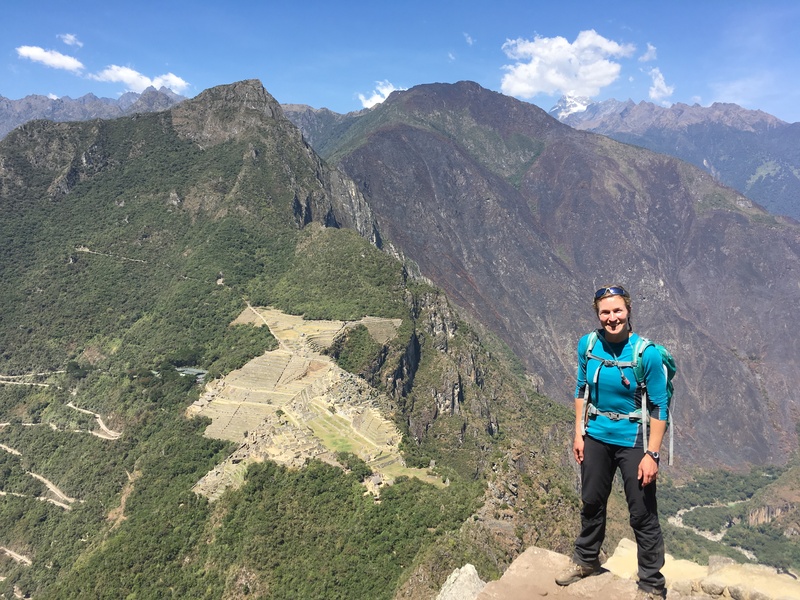 The iconic peak behind the buildings, Huayna Picchu, or ‘young mountain’, gives a Condors-eye view if you can face the steep steps up to the exposed summit. It was well worth the effort to appreciate the sheer scale and impressive defensive position of the Incan site. Our guide Jose took us round the site and we had time to soak it all in before boarding the train back towards Cusco. Retracing the 42km we had walked over 4 days, this time by train in only a couple of hours, emphasised the wonderful and challenging journey we had travelled.